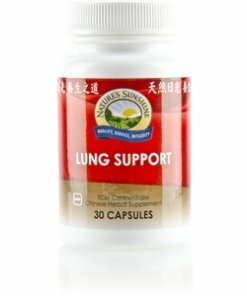 Nature’s Sunshine Lung Support TCM Concentrate blends 16 herbs used in traditional Chinese medicine to support the lungs. The same formula as Chinese Lung Support but in a highly concentrated form, this blend of herbs supports a weakened metal constitution. Known as fu lei or “strengthen the weak and thin” in Chinese, Lung Support TCM combines anemarrhena, aster, bupleurum, and astragalus among other herbs to provide immune support, boost energy, and nourish the respiratory system. Instructions: Take two capsules with a meal daily. Each capsule is equivalent to 5 capsules of regular Chinese Lung Support combination. TCM denotes Traditional Chinese Medicine.